Darwinia+ is what life would be like in a computer. Single "polygon" organisms called Darwinians live their simple lives learning, growing, and dying to be reincarnated as other Darwinians. In the game, Darwinia is under attack by an evil computer virus (called "Virii"), and it's up to you (a new programmer) to bring this virus under control to save this delicate computer ecosystem. Your army is a handful of soldiers, which is upgradable from three units to six. You will also have Engineers, which aid in upgrading your army and capturing buildings or locations. Your goal is to kill the virus, and rescue as many Darwinians as you can. The game plays similar to a hybrid between a simple (yet effective) RTS, and Lemmings. While your soldier group will take orders from you, killing enemies in a twin-stick shooter style (you control them with one analog stick, and the other shoots in whichever direction you tilt it), your Darwinians aren't quite as good at listening. You will upgrade the ability to promote one of your Darwinians to a leader status in the game. Your Darwinians will then follow whatever path you dictate the leader to send them on. They will walk in a straight line, danger or no. You can set up multiple leaders as relay stations to redirect Darwinians, which is part of your strategy for playing. 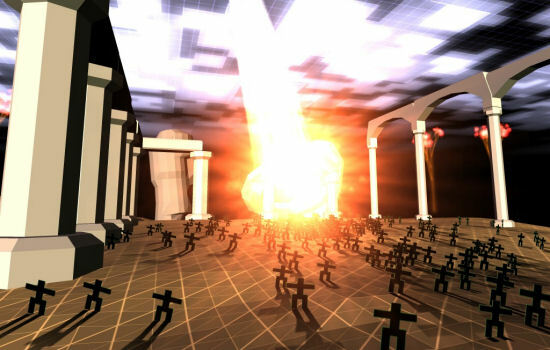 The single player Darwinia is played in a digital ecosystem. Digital trees, polygon landscape, and digital ambient sounds. Visually, the game is very appealing with simplistic stylized graphics that imitate the environment they're supposed to represent very well. The soundtrack also matches the feel of the game very nicely. Combined with an intriguing story, where you have to dominate landscapes to regain life essentials for the Darwinians to be able to thrive (a mine for processed materials, a power generator, and a construction yard). As the story progresses the virus gets more vicious with bigger, badder, and uglier meanies. You'll have to use different strategies to accomplish your goals, and rescue Darwinians before more of the virus reappears to wipe out your force. Page created in 1.2919 seconds.